Sprinkle the work surface with the flour. Unfold the pastry sheet on the work surface. Using an egg-shaped cookie cutter, cut out 12 (about 2 1/2-inch) pastries. Place the pastries onto the baking sheet. Stir the marshmallow creme and whipped topping in a medium bowl. Spoon the marshmallow mixture into a pastry bag with a small plain tip. For each pastry, insert the end of the pastry tip into one end of the pastry. Slowly pipe the marshmallow mixture into the pastry to fill. 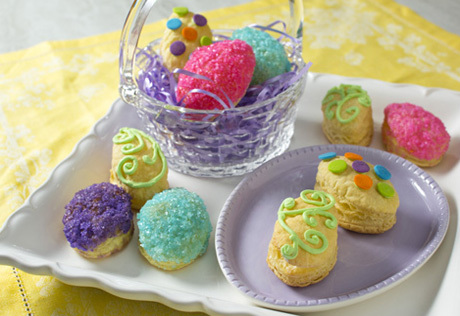 Decorate the filled pastries with frosting or drizzle with melted chocolate or confectioners sugar glaze, if desired. To Decorate with Sanding Sugar: Brush the tops of the unbaked pastries with a mixture of 1 egg and 1 tablespoon water (beat in a small bowl with a fork), then sprinkle with the sanding sugar before baking.